Hi everyone! How is your spring going? I bought myself some Essie polishes from their last year’s collections. They weren’t available in my country and I couldn’t buy them when they came out. But now I found a web site that sells drug store line from Essie (the wide brush) and I bought myself 10 polishes :O. And they were really cheap, 3,5€ each. I don’t know if they are any cheaper anywhere else. So I decided to use the new Essie polishes and the result was very colourful (of course I didn’t use all of them in this mani :)). 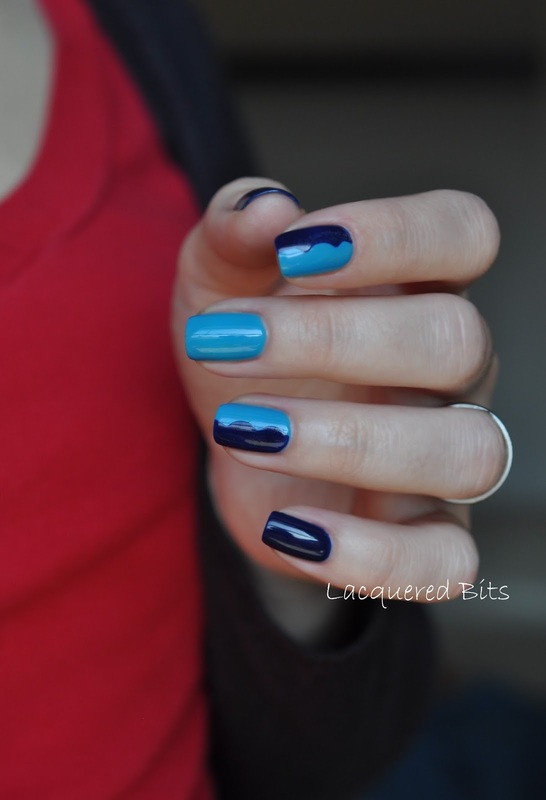 The dark blue is Essie – Style Cartel. A gorgeous deep blue with a jelly finish. I looved how easy was the application. Easy to work around the cuticles, no streakiness and opaque in two coats. Deep blue perfection! 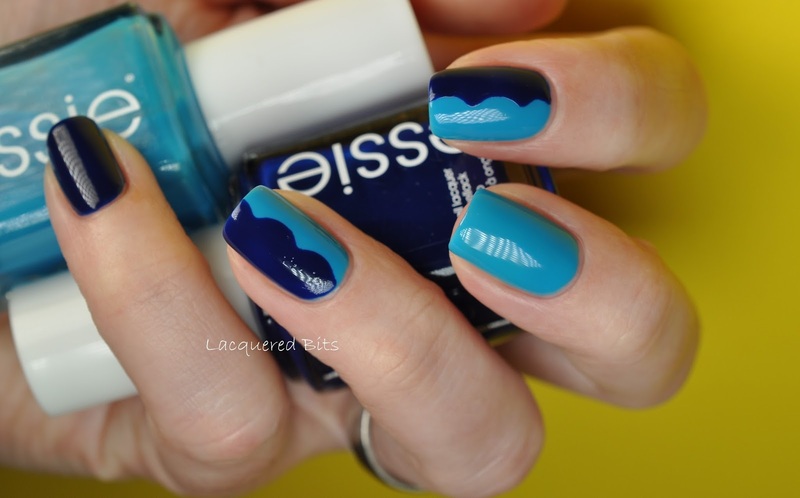 The light blue is Essie – Strut Your Stuff. Also easy to work with. It did flood my cuticles a little, but it was easy to clean. Opaque in two coats with a jelly finish and also no streakiness. A close up on the waves. To achieve these I used some regular tape and cut it with scissors which have this wavy pattern. I wanted to do the regular chevron pattern, but I didn’t have any stickers at home, so I did this instead. Firstly I applied the light blue polish and waited for it to dry. 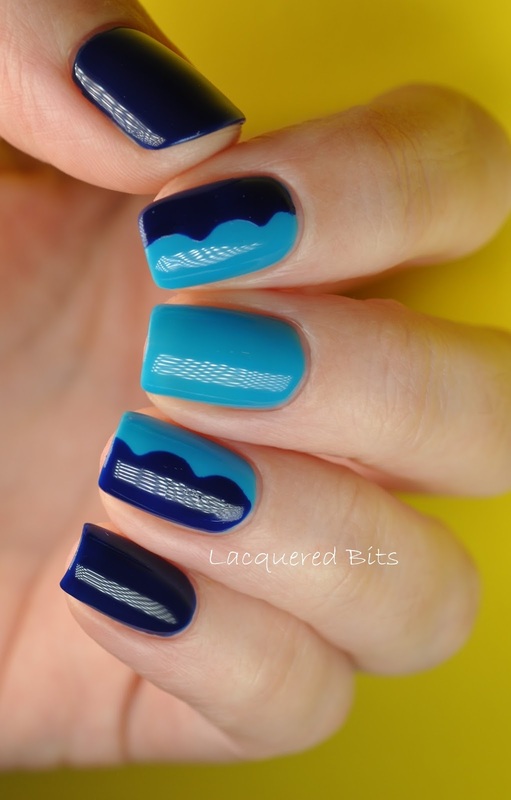 Then I put on the tape and the dark blue polish to create the waves. And I added yellow background (btw that is the wall in dining room behind my hand) to emphasize the colours. And here with my red shirt. I think the yellow works better. What are your thoughts on this one? 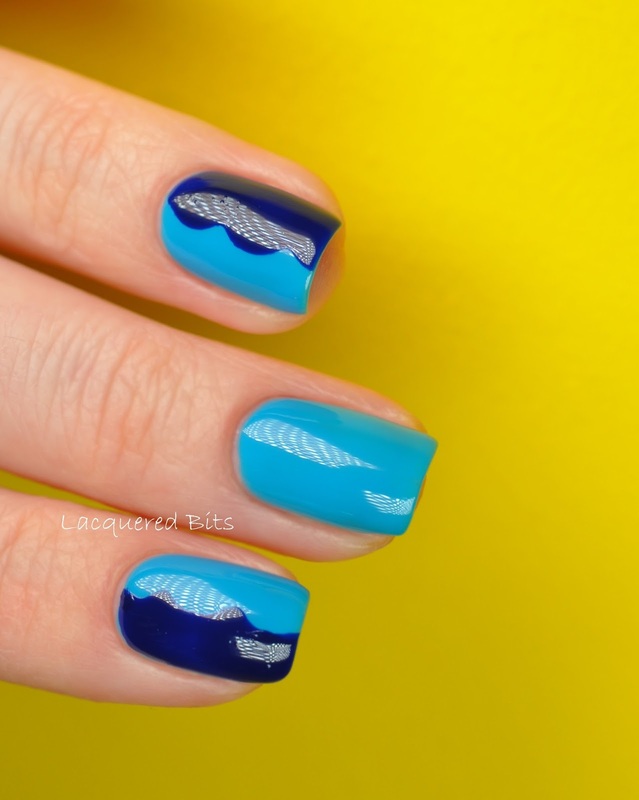 I love these two colors together with the waves. Makes me want to just escape to Barbados right now! Oh this makes me think of spring and sun and sea DESPITE the downpour outside.